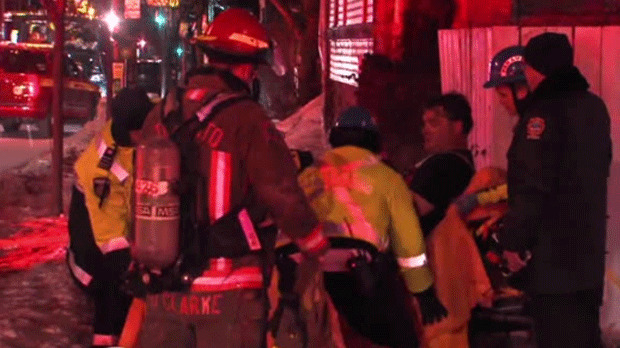 A firefighter that was injured responding to a call at a rooming house in Parkdale is shown on a stretcher. Two people required treatment in hospital, including a firefighter, after an overnight blaze at a rooming house in the city’s west end. The fire is believed to have started in the basement of the residence on Temple Avenue near King and Dufferin streets at around 2:10 a.m.
Captain David Eckerman says that a caller initially said that there were people trapped in the basement amid visible flames and billowing smoke, however everyone eventually got out. Eckerman said that one firefighter did go to St. Joseph's Health Centre as a precaution due to minor smoke inhalation. Paramedics said that they also transported another individual to hospital with serious but non-life threatening injuries. A woman who lives next door told CP24 on Saturday morning that she smelled smoke and came outside to see the entrance to the basement unit engulfed in flames. “My neighbor was just flipped out screaming about her babies which are her kittens. She was just going crazy. The flames were coming right out through the house, so I was trying to calm her down and find out if anybody else was in the house,” the woman said. According to Eckerman, a total of six people have been displaced as a result of the fire and are receiving assistance from the Red Cross. The fire was listed as a two-alarm call, though the majority of crews have since cleared.